If I ask you to picture a bear in your mind’s eye, you’ll probably conjure a majestic beast covered in fur that dwarves most other carnivores on the planet. Well, meet Eve. When she was first found, her rescuers didn’t even know she was a bear for sure. 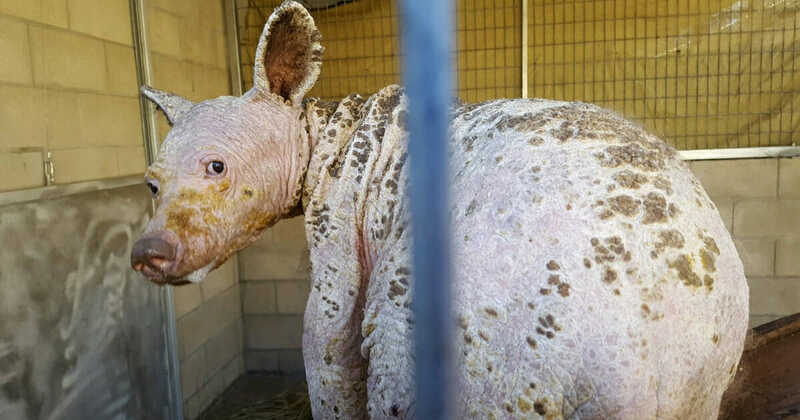 Hairless, pink, riddled with scabs and stripped of her dignity, it was difficult to discern that Eve was actually one of the proudest animals on the planet. Dubbed “Eve” due to the day she was found, the young black bear was afforded a place at The Fund for Animals Wildlife Center. They quickly realized she was suffering from extensive mange and smaller than she was supposed to be (her lack of food had stunted her development). Fortunately for Eve, she was given extensive treatment against the lice that were feasting on her skin, and regular baths started to restore her coat. Cruising around run one of her new bear enclosure. However, by April – some four months later – her progress still wasn’t what staff wanted it to be. On Facebook the center wrote: “We did see fur regrowth on sections of her body during her last exam, but it is very sparse, overall. She does still have some crustiness on her cervical and upper thoracic spine area and oddly, that is where a lot of her fur growth is as well. By July, however, the mange had all but gone, even if Eve continued to fight skin infections and required medication. Eventually, the Wildfire Center came to the decision that it was best for Eve that she stayed living in captivity, as her lack of fur could have endangered her life. That, along with the California wildfires that ravaged the State at the back-end of last year, meant it wasn’t viable to release her. However, all wasn’t bad for Eve. The center have started to raise funds to ensure she has her forever home. They said: “We have always been committed to Eve’s care and have always put her best interest foremost — just as we do now. We will continue our commitment and are in the initial stages of preparing Eve for a Forever Home at our sister animal sanctuary, Cleveland Amory Black Beauty Ranch in Texas. It’s thanks to a number of extremely kind people that Eve has been given a second chance in life. We think the transformation is truly something special! If you agree that Eve’s turn around is spectacular, share this article on Facebook!